"We have a good understanding of the functions of about 1,000 to 2,000 critical human genes that – deservedly – have been very well studied," said UCSF cancer biologist Luke Gilbert, Ph.D., one of the new study's two senior authors. 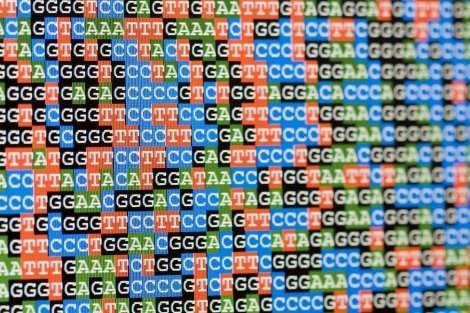 "But that's less than 10 percent of the 25,000 genes in the human genome. Of the rest, perhaps half have been studied at least a little by someone, and the other half we know next to nothing about." "This is not surprising, because the experiments needed to test gene function are expensive and time consuming, so you need to prioritize the genes you think are probably the most important," added Max Horlbeck, Ph.D., who recently completed his doctoral work in the lab of UCSF cell biologist Jonathan Weissman, Ph.D., the study's second senior author. "But there are mysteries hiding in the rest of the genome that could lead to brand new treatments for a wide variety of diseases, and now we have a technique that can quickly and comprehensively map out how these unstudied genes fit into our broader understanding of biology." The approach involves systematically shutting down pairs of genes in individual cells and measuring how the cells respond, which teaches researchers about the relationship between the two genes. In some cases, scientists observe that shutting down either gene in a pair does as much damage to the cell as shutting down both, which suggests that the two genes are part of the same functional system – much as removing two different components of a car's steering system would have a similar effect on the car's ability to turn. This kind of data lets researchers quickly identify genes of unknown function as parts of larger functional systems. In contrast, researchers can also identify pairs of genes that have independent but synergistic functions, when shutting down both genes has a dramatically larger effect on cells than shutting down either gene on its own. If your car's main brakes aren't working, the problem is much worse if your emergency brake is out, too. The strategy of targeting such synergistic relationships – known as synthetic lethality – is a major priority of drug companies seeking to target diseases such as prostate cancer because it allows them to design powerful combination therapies that target multiple cellular pathways at once to gain a more dramatic effect. In the new study, Horlbeck and colleagues performed interaction mapping on 472 genes that previous experiments had linked to cellular growth and survival. To do this, they used a tool called CRISPR inhibition (CRISPRi), a version of the CRISPR gene-editing system that turns down the volume on a gene's activity without editing the DNA itself, which was developed for use in mammalian cells by the Weissman lab in 2013 (also see the lab's 2016 study decoding the functions of non-coding RNA molecules). "While our previous work establishing the CRISPRi screening technology allowed us to simply identify which genes are important in a given context, such as cancer cell proliferation, this extends that to allow us to ask what is the function of each gene that makes it so important," Weissman said. Among other findings, the researchers were surprised to note significant differences in mitochondrial energy production pathways between the two subtypes of leukemia they studied. "You would expect such essential gene pathways to be hard-wired – the same in skin cells or leukemia cells," Gilbert said. "But discovering differences between these two cell lines suggests that you could come up with distinct ways to target energy production in these cancers therapeutically. That's particularly exciting for T-cell acute lymphoblastic leukemia, which doesn't have a lot of great targeted drugs." "Right away it didn't make a whole lot of sense why interfering with cholesterol synthesis would make cells dependent on the DNA damage response," Horlbeck said. "It made even less sense when we looked at another gene just a few steps away in the cholesterol synthesis pathway and found that it had no interaction with DNA repair genes at all." "Up until now science has produced a lot of data about specific mutations that drive human diseases, and we have a pretty good idea about which cells express what genes across human body, but we fundamentally don't understand how genes work together in human cells," Gilbert said. "With this new approach we are starting to build a portrait of how genetic interactions keep tissues healthy or to drive disease processes, but there is a whole lot more to learn."